Digital Camera Review: If you’re in the market for a simple to use, affordable camera, the Nikon Coolpix L2 is an excellent option (as are its siblings, the Coolpix L3 and Coolpix L4). The ease of use of this camera is hard to beat and it produces consistently good images. Most entry-level users will also be pleased with the Nikon Exclusive Feature System – the Face Priority AF makes focusing a portrait a no brainer and the D-Lighting will correct the lighting on shots to provide pleasing results. The use of AA batteries removes the need to carry around an extra charger and the battery life is very good. I would highly recommend getting high-capacity NiMH rechargeables – not only do they last longer in the camera, but they become very cost-effective over their lifetime. 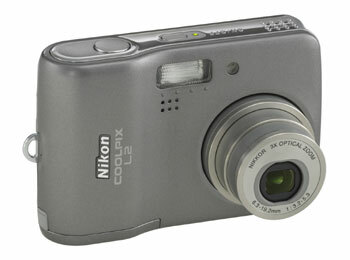 The compactness of the camera also makes it easy to slip into a shirt pocket, pants pocket, or purse. If you’re looking for a wealth of features and settings, this camera is not for you. Nikon has done a good job of providing an affordable camera and removing a lot of features that its target user will never use.